CLAIM YOUR 3 FREE CLASSES BY 31 AUGUST 2018! Pilates Fitness is the first in Singapore to offer goal-oriented, lifestyle Pilates classes to solve various lifestyle woes. We specialised in Weight Loss and Pain Management Pilates classes. If you want to lose weight and body fat in a sustainable and safe way or to attend high intensity Pilates class, try our Weight Loss class. If you want to reduce body aches, go through a rehabilitative program for your injuries or simply a slower Pilates class, go for our Core & Body Aches Pilates class. 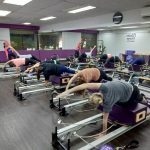 We offer Pilates Reformer with props classes in clean and friendly studios. We believe in group class dynamics. Since people working out with you in the same class have the same fitness goals as you, there is peer motivation that encourages you to work harder together. We only engage full-time, trained Pilates instructors with a minimum of 200 training hours with our Founder to ensure that our instructors are committed to your growth and fitness goals. We know that you will be a happier, healthier and more confident person when you get rid of body aches, break your bad posture habits and look good. All of us have been through that transformation and we want to share our secrets with you. Come join us for a workout today!